I find my spot on a rock after having hiked the area of Forsythe Canyon and Twin Sisters Peaks for the last few hours. Ironically I can throw a rock to my car which is parked 100′ below me as I face north overlooking County Road 68, a four wheel drive dirt road frequented by recreationalists from nearby Boulder. 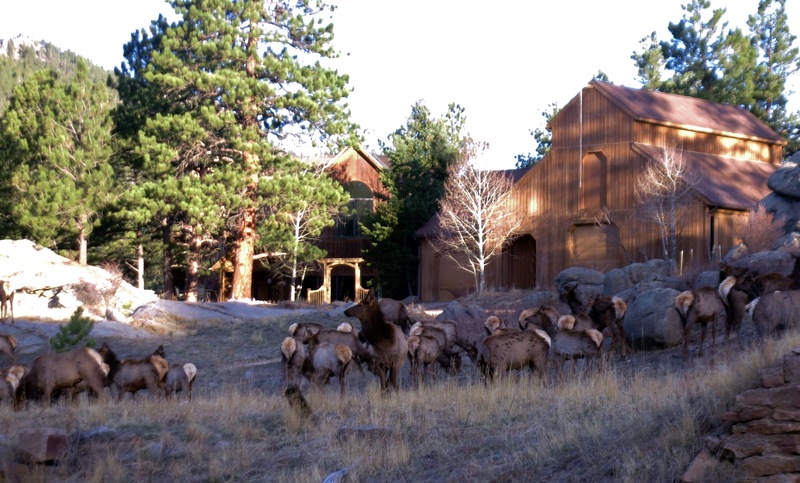 When I rounded the corner earlier this morning driving to my normal parking spot I was greeted by a large herd of elk. They were too great in number to count and were on either side of the road, spread out around local residences here in the foothills. In my estimation there were 150-200. (How many can you count in the image above?) After hiking for a while I decided to venture back to where I began and observe the herd. As I now sit looking north I see a small fraction of them bedded in an island of Ponderosa Pines, on the edge of a large meadow, in what would actually be considered someone’s front yard, except it is in the mountains. I sit on public property, but the elk are bedded down on private property, about 500 yards away. I hear voices from the east and six cyclists pick their way down the steep dirt county road. I view them through my binoculars and I think I recognize the fifth rider as John Talley, an old friend I raced with a few years ago in front range races. I refrain from shouting at him and am always amazed how one, while just sitting still, can go unseen by humans, yet animals much farther away will tune in to me so easily and quickly, more often than not, because my scent gives me away. The elk number about a dozen and one feeds while the others rest, all heads alert and looking south/southwest where the noise and activity comes from. Their coats are ragged like moth eaten garments, as they move from enduring the winter toward spring, a season of renewal. I’ve seen the new grasses begin to emerge which will offer key nutrients to the elk, especially the cows, as they prepare to give birth to their calves and will be supplying milk for the newborns. The thin clouds above offer a cool day, the sun working hard to make its heat felt but never shining completely through. Two more cyclists move down the dirt road below me, their voices echoing for minutes before I ever catch sight of them. After 25 minutes I glass to the west of the dozen and spy more elk in the trees. I see a head of one, the horizontal line of another as it lies down in the grass, just the elongated snout of one farther away mainly obscured by a pine. They have been here the whole time but when they are not moving it is much more challenging to pick them out, even as there are more than a hundred in the area. Friends of mine often comment how surprised they are that we don’t see more wildlife when out hiking. But large mammals of the forest do not move much. Their life consists of eating, resting and procreating. Wasting precious energy means burning valuable calories, making them vulnerable to conditions and predators. For many hours of the day, especially during daylight hours, they are bedded down watching the world around them, alert to any potential dangers. The two groups of elk now begin to converge, with some feeding toward the other group. I think I’ve missed one jumping a fence but upon closer observation I realized that there are only posts in the ground, no actual physical boundary connecting each of them. A black billed magpie lands on the back of a feeding elk. The elk, either used to this kind of activity or oblivious to the fact that the bird is on its back, continues to feed without missing a beat. The magpie walks the length of its spine and then flies off. I’ve read that magpies will do this with mule deer, picking lice and bugs out of the hair. They must do the same with elk, who have much longer hair than their ungulate cousins. The magpie doesn’t stay long and I wonder if bugs and such would not be present yet this early in the season? In summer and fall when I have frequented this area I have seen many deer and even moose on one occasion. But the elk only winter here, arriving in late fall when the snows and lack of feed force them down from the nearby (some 15 miles as the crow flies) Continental Divide. They migrate gathering numbers as they cover the miles on their annual journey. This makes them a “migratory” herd. (There is a herd where I sat earlier this year that never migrates, staying in one large general area on the plains. They are considered a “residential” herd.) The elk will remain here until the cows calve in May. Not long after, as the temperatures rise and snows begin to melt, they will all move back to the high country and separate out into smaller groups for the summer months until the whole process repeats itself again in the fall. As I sit and continue to observe the elk I remark in my mind of how peaceful it is today. There are the occasional cyclists and I can hear some local residents working outside but by and large it is calm, serene and beautiful today. There is an ease about it as my hour here draws to a close. I’m grateful for the opportunity to observe this herd of elk. They have been particularly gracious as they can prove skittish, elusive and mysterious during other times of the year. I look forward to observing them in other locales during this coming year as part of this project, for they capture my soul like no other member of the deer family. Once again I feel as if I’m there right beside you. And I vow to be more in tune to the present moment and to nature on my daily walks. I think you probably are pretty much in tune. Unfortunately, when I’m working my head is usually spinning with ideas, things to do, busyness.